Yearbooks are, by definition, a record of the year. An annual publication containing statistics, commemorating school activities and student accomplishments. A history book of life at your school, during a period of time. Of course, the goal is to make the yearbook interesting and engaging. In order to do this, the yearbook staff’s job is to combine both fact and entertainment. The big question is: how? One foolproof way to add interest is to include as many people as you can onto the pages of your yearbook. This means not only triple checking that a photo of every person in the student body is included, but also adding those ‘student interest’ pieces that are going keep pages turning. These shouldn’t be full features, but mini-interviews or surveys. They don’t need to take up much of the valuable real estate in your book, consider them a 'high-interest page filler'. Using a PIctavo Snippet to contain the information creates a great design package that you can use on any student page. How in-depth you’d like your student interest pieces to be is entirely up to your yearbook staff. Some questions are suited for both an entire school survey OR a “man on the street” style photo and answer. Others will require more lengthy answers and each package will only allow for a single interview subject to be represented. We’ve created a few examples to get your creative juices flowing! Ambush interviews are great for that entertainment factor we've been mentioning. Keeping subject matter light and fun will ensure that students will want to be interviewees! Being able to get content for your yearbook from the student body not only keeps your yearbook accurate, it also gives readers that 'day in the life' reality that is indicative of the time. Make your interviews casual and fun. In doing so, your replies will be conversational and real. Survey questions should be multiple choice so creating infographics is easy and straight forward. Still looking for more ideas? The Snippet pages of the Pictavo Design Guide are loaded with more ideas. Take a look and get inspired! Does your school have any "untraditional helpers" that you might want to consider featuring in your next yearbook? Even if you don't end up putting them in the portrait section, you could feature them in a callout or even have a page dedicated to them. Capturing the essence of your school sometimes includes thinking beyond the traditional. What untraditional things have you included or featured in your yearbook? Just because you’re not IN school during the summer months, doesn’t mean there aren’t important things going on, begging to be captured and included in your yearbook. After all, isn’t the purpose of your YEARbook to tell the story of the entire year? So how do you identify those stories and cover them? Check out these five great tips to follow as you enter into your summer months. Remember – sometimes the stories and happenings of the summer can be the most interesting! What happens in summer shouldn’t stay there—it should be captured in the yearbook! Create a detailed plan with specific assignments for each staff member broken down by week. This helps make the tasks more manageable and easier to track progress. Your plan should include actionable items that each student can accomplish to contribute. Create a laundry list of coverage ideas (summer school, camps, jobs, vacations, volunteer activities, events, retreats, summer sports, fundraisers, etc.). Use social media to stay in the loop and find interesting stories to cover. Have a photographer and reporter pair up to cover an identified event together. Both can offer differing perspectives and help each other better capture the heart of the final story. Don't forget to use your "Press Badges" (or create some) to give your staffers credibility and make it easier for them to get interviews and photos. Teachers and other school staff use their summers to do all kinds of cool things. Some continue to teach or have other summer jobs while some travel, do research, take classes, vacation or spend time with their family. Be sure to include them when investigating potential story ideas and photo opportunities! A lot happens in the final weeks before school starts and these activities provide great opportunities for coverage (sports tryouts, freshman orientation, classroom and school grounds preparation, club meetings, school board sessions, back to school shopping, etc.). 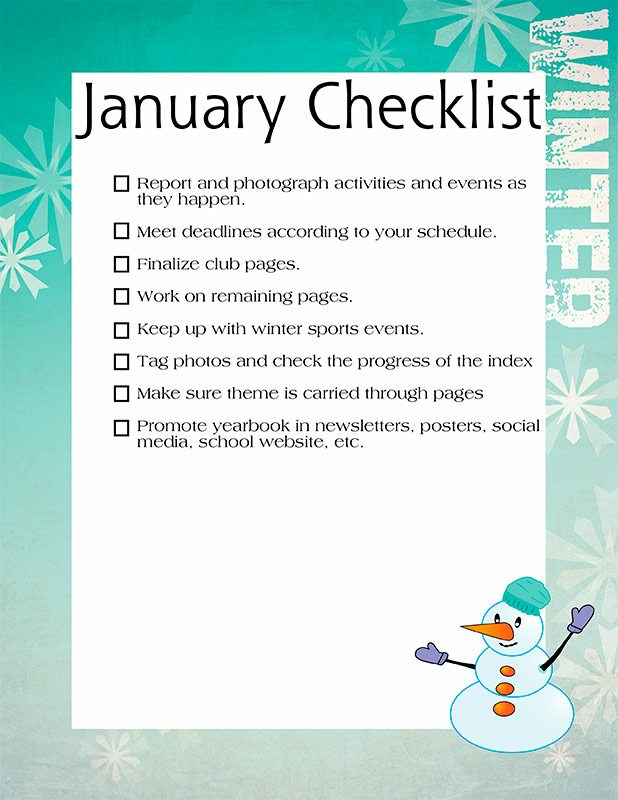 Here's your January checklist of items to do for your yearbook to keep you on track this year! Just click on the link to download the checklist to have on hand. 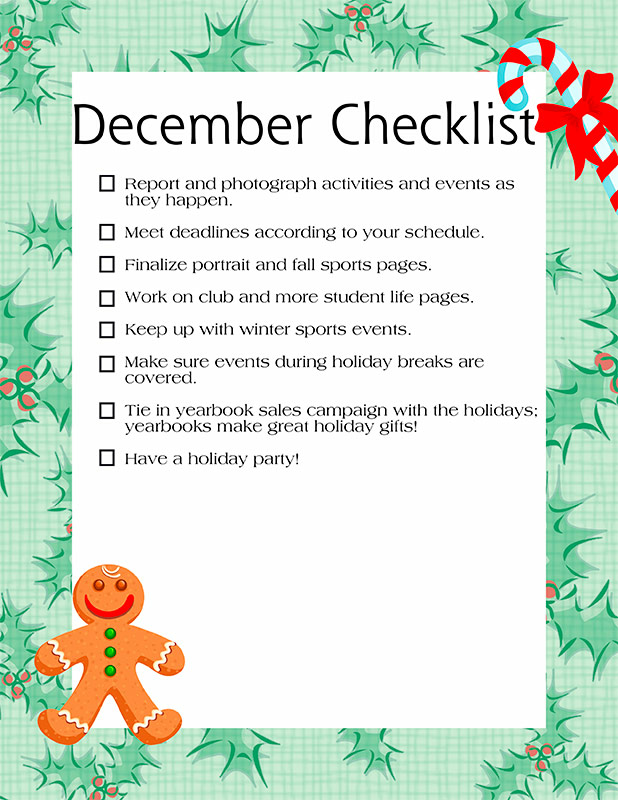 Here's your December checklist of items to do for your yearbook to keep you on track this year! Just click on the link to download the checklist to have on hand. Here's your November checklist of items to do for your yearbook to keep you on track this year! Just click on the link to download the checklist to have on hand. We hope you are having a wonderful summer! We sure are, but yearbooks are always on our minds - even during the summer! Have you ever considered adding pages of things students did over the summer in your yearbook? Maybe there was a class trip, special competition, concert or volunteering event that deserves coverage. Or maybe you simply want to capture the fun things students are doing during their time off. Including pages that capture summer activities are a great way to encompass an entire year in the book, instead of just the months everyone is in school. And it's a great way to include even more people in the yearbook! Check out this book's spread of summer fun! Be sure to be capturing photos of this summer's activities and ask students to submit their favorite photos when you get back to school. Happy Summer and Happy Yearbooking!